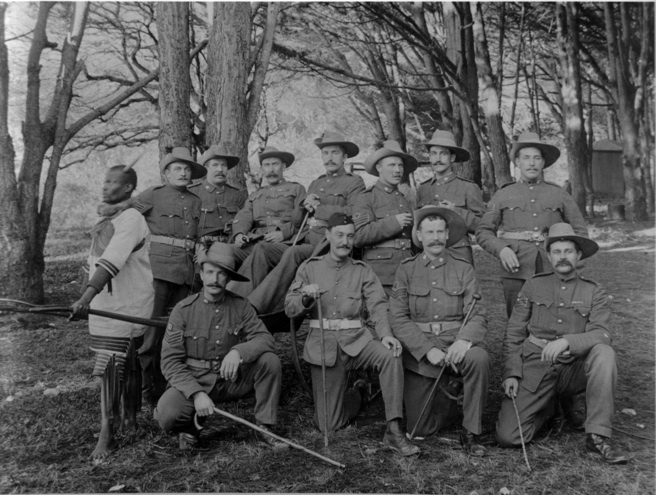 In South Africa during the Boer War. Henry Hudson is third from the right in the back row. In the 1891 census for Wantage Henry was listed as a gardener but he soon afterwards enlisted in the Coldstream Guards. Attested and passed fit at Reading on 29th Feb 1892. Joined, as No. 8963, the 1st Battalion, Coldstream Guards. He was then 18 years 9 months old and gave his occupation as a gardener, was 5 ft 9 1/4 inches in height, weight 144 lbs, chest minimum 34 maximum 36 inches, fresh complexion, blue eyes, lt brown hair, had a scar on nape of neck, and was Church of England. He initially signed up for 3 yrs plus 9 on the reserve. This was extended to 7 yrs 7/7/93 and 12 yrs 24.6.94. He re-engaged at Windsor 13/1/1904 to complete 21 yrs service. He was promoted Cpl 4/8/95, Sergeant 1/5/97 and Colour Sergeant 9/6/1901. He died of pneumonia on 4th January 1908 in the Military Hospital, Millbank. Home 5/10/02 to 4/1/1908 with a total service of 15 yrs 311 days. He obtained Certificate of Education 2nd Class 14/3/94 and passed a class of instruction in musketry at Hythe 23/12/1902. served in the South Africa campaign 1899-1902. Was mentioned in despatches in the London Gazette 10.9.1901, and awarded the South Africa War Medal with clasps for Belmont, Modder River, Dreifontein, Johannesburg, Diamond Hill, and Belfast. He also had the Kings SA Medal with clasps for SA 1901 & 1902. Dates of Battles in the South Africa War for which clasps were awarded. Belmont:23rd November 1899 under command of Lieut.-General Lord Methuen. Modder River:28th November 1899 under command of Lieut.-General Lord Methuen.